Tumor-associated immunosuppression aids cancer cells to escape immune-mediated attack and subsequent elimination. Recently, however, many oncolytic viruses, including reovirus, have been reported to overturn such immunosuppression and promote the development of a clinically desired antitumor immunity, which is known to promote favorable patient outcomes. Contrary to this existing paradigm, in this article we demonstrate that reovirus augments tumor-associated immunosuppression immediately following its therapeutic administration. Our data show that reovirus induces preferential differentiation of highly suppressive CD11b+, Gr-1+, Ly6Chigh myeloid cells from bone marrow hematopoietic progenitor cells. 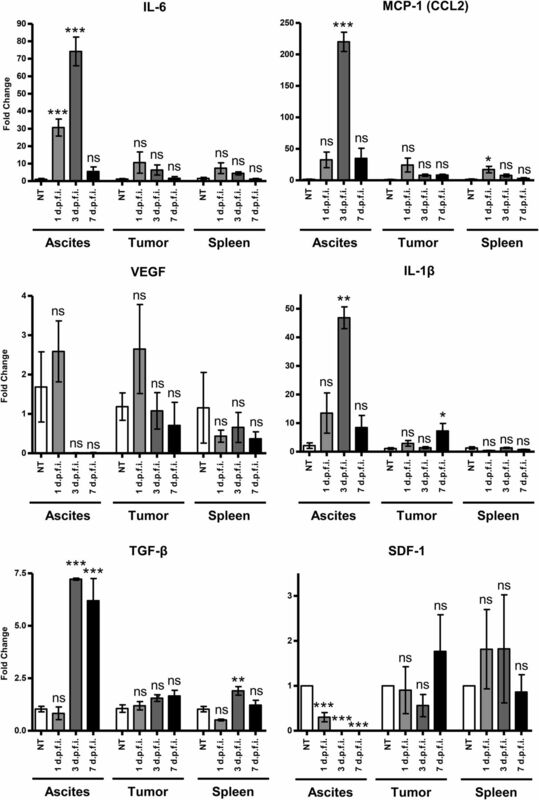 Furthermore, reovirus administration in tumor-bearing hosts drives time-dependent recruitment of CD11b+, Gr-1+, Ly6Chigh myeloid cells in the tumor milieu, which is further supported by virus-induced increased expression of numerous immune factors involved in myeloid-derived suppressor cell survival and trafficking. 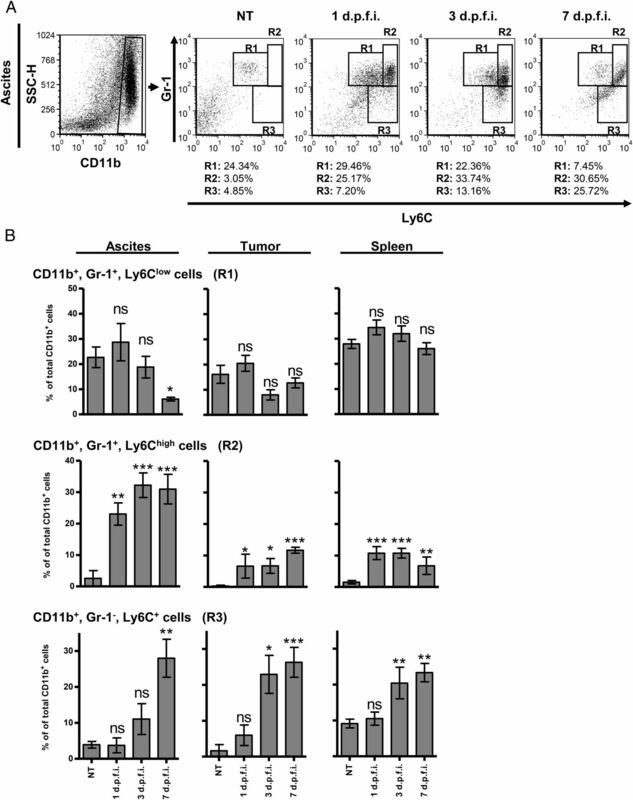 Most importantly, CD11b+, Gr-1+, Ly6Chigh myeloid cells specifically potentiate the suppression of T cell proliferation and are associated with the absence of IFN-γ response in the tumor microenvironment early during oncotherapy. Considering that the qualitative traits of a specific antitumor immunity are largely dictated by the immunological events that precede its development, our findings are of critical importance and must be considered while devising complementary interventions aimed at promoting the optimum efficacy of oncolytic virus–based anticancer immunotherapies. Anticancer immunotherapies target cancer cells by exploiting the beneficial functions of the immune system and represent one of the most promising modern therapeutic interventions for the treatment of cancers (1). These immunotherapies usually focus on establishing anticancer immune responses by stimulating the otherwise suppressed immune system of cancer-bearing hosts. Evidence thus far clearly demonstrates that a robust antitumor immune response can eliminate existing cancer cells, establish protection against possible relapse, and is associated with favorable patient outcomes (2–4). Cancers of almost every origin, including prostate, colon, breast, ovarian, and advanced melanoma, have been successfully targeted with various immune-based interventions (5–7). However, the tumor-associated immune microenvironment usually contains various suppressive mechanisms that resist the successful development of anticancer immune responses. Thus, the efficacy of anticancer immunotherapeutic options is dictated by the immunological niche present in and around the tumor microenvironment. Hence, the successful implementation of anticancer immunotherapies demands a thorough understanding and management of tumor-associated immunosuppression. Reovirus, a naturally occurring benign human pathogen, preferentially targets and kills cancerous cells (8), and is currently being evaluated as an anticancer agent in phase I, II, and III clinical trials internationally (9, 10). As with other oncolytic viruses (OVs) (8, 11–14), the use of reovirus as an anticancer therapeutic was based on its capacity to preferentially kill cancer cells (in a process known as oncolysis) while leaving normal cells relatively unharmed. However, recent discoveries have shown that, in addition to its direct oncolytic activities, reovirus also stimulates the immune system of cancer-bearing hosts and induces clinically relevant anticancer immunity. These reovirus-induced antitumor immunotherapeutic activities target existing cancer cells and can protect the host against subsequent tumor relapse even after discontinuation of the therapy (15). Following its therapeutic administration, reovirus invokes a sequence of immunological events that ultimately overturns numerous tumor-associated immune evasion mechanisms and facilitates the development of antitumor innate and adaptive immune responses (15–21). Thus, comprehensive characterization and subsequent therapeutic management of the virus-induced immunological events are absolutely necessary to harness the beneficial effects of reovirus-driven anticancer therapy. Recently, tumor-associated myeloid-derived suppressor cells (MDSCs) have been identified as one of the key mediators of tumor-associated immunosuppression. Apart from their immunosuppressive functions, MDSCs also influence angiogenesis and metastasis (22), and thus represent a major therapeutic target that could be manipulated to facilitate antitumor immunity. In mice, MDSCs were originally defined as cells expressing CD11b (αM-integrin) and Gr-1 markers, whereas in humans these cells were mainly defined as CD11b+, CD14−, CD33+ or LIN−, HLA-DR−, CD33+ cells. However, it is now clear that MDSCs represent a heterogeneous population of cells that consists of progenitor as well as immature myeloid cells (IMCs) (22, 23). These subpopulations of MDSCs are shown to have differential biological roles and require further phenotypical characterization to enable precise therapeutic targeting. Considering this gap in existing knowledge, recent efforts have been focused on further dissecting various subpopulations within MDSCs. In healthy individuals, MDSCs are generated in the bone marrow (BM); are subsequently differentiated into mature granulocytes, macrophages, or dendritic cells; and are believed to be involved in regulating hyperactive or unnecessary immune responses (24, 25). With respect to cancer progression and treatment, MDSCs have a remarkable ability to inhibit tumor surveillance and killing (26–30) via direct suppression of anticancer T cells, indirectly through the recruitment of regulatory T cells and squelching of essential nutrients for T cell activity (22, 26, 30). Furthermore, MDSCs have also been reported to regulate innate immune responses of NK cells (31) and modulate cytokine production by macrophages (27). These myeloid cells have also been studied in the context of parasitic (32), bacterial (33), and viral infections (34–36). Although the exact role of MDSCs in such processes is still obscure, increasing evidence thus far suggests that pathogen-mediated accumulation of MDSCs postpones host pathogen clearance and contributes to the critical balance between pathogen eradication and pathogenicity (32, 36). Recently, we reported that i.p. therapeutic injections of reovirus drive the accumulation of CD11b+, Gr-1+ myeloid cells in the tumor microenvironment of hosts with peritoneal carcinomatosis (PC) (17, 18). However, the detailed characteristics, the pathophysiological significance of such virus-driven MDSCs, and the possible subpopulations in the context of tumor microenvironment are at present unknown. Hence, this study was focused on dissecting the phenotypic heterogeneity, kinetics, differentiation, chemotactic trafficking, and functional capacities of OV-driven myeloid cells. Contrary to the existing dogma, we demonstrate that oncolytic reovirus promotes the generation and recruitment of highly suppressive CD11b+, Gr-1+, Ly6Chigh myeloid cells into the tumor microenvironment and transiently potentiates tumor-associated immunosuppression during the early phase of oncotherapy. In light of the ongoing phase III clinical trials, these findings bear crucial significance and must be considered when designing complementary approaches aimed at enhancing the efficacy of OV-based oncotherapies to promote better cancer outcomes. Reovirus (serotype 3, Dearing strain) was grown, amplified, and purified using the previously described established protocol (8). Mouse ovarian surface epithelial cell line (MOSE, clone ID8; from here on referred to as ID8 cells) were obtained from Edith Lord (University of Rochester, Rochester, NY) (37) and grown at 37°C in 5% CO2 concentration in RPMI 1640 complete (10% FBS, 1× sodium pyruvate, 1× nonessential amino acids, 1× Anti-anti, and 1× Glutamax [all obtained from Invitrogen, Carlsbad, CA]). The following reagents were purchased from eBioscience (San Diego, CA): Alexa Fluor 488–anti-Mouse Gr-1 (RB6-8C5), APC–anti-Mouse Gr-1 (RB6-8C5), PE–anti-Mouse Ly6C (HK1.4), APC–anti-Mouse F4/80 (BM8), PerCP-Cy5.5–anti-Mouse CD11b (M1/70), PE–anti-Mouse CD3e (eBio500A2), PerCP–anti-Mouse CD8a (553036; BD Biosciences, San Jose, CA), functional grade purified anti-Mouse CD28 (37.51), functional grade purified anti-Mouse CD3 (145-2C11), APC–anti-Mouse IFN-γ (eBio17-7311), 5- (and 6-) CFSE. The Alexa Fluor 488–anti-Mouse Ly6G (1A8) was purchased from BioLegend (San Diego, CA). All in vivo experimental procedures were conducted with approval from the Ethics Committee at Dalhousie University, Halifax, Nova Scotia. Female wild-type C57BL/6 mice, aged 6–8 weeks, were purchased from Charles River Laboratories (Montreal, QC, Canada) and were treated as shown and/or described in respective figures. Splenocytes containing lymphocytes and BM hematopoietic progenitor cells were isolated as previously described (17). Ascitic fluid from the peritoneal cavity of the PC-bearing mice was centrifuged to pellet constituent cells. The supernatant was removed and stored as cell-free ascitic fluid to be used in various assays, whereas pelleted cells were further processed to obtain MDSCs. For isolation of MDSCs, a single-cell suspension obtained from ascitic fluid was first separated using Ficoll gradient (95021-205L; GE Healthcare, QC, Canada) and then processed through the Myeloid-Derived Suppressor Cell Isolation Kit (Miltenyi Biotec, Auburn, CA) according to the manufacturer’s instructions. The purity of the isolated MDSCs was usually >90% (Supplemental Fig. 1A, 1B). In addition, fluorescent cell sorting (FACSAria III; BD Biosciences) was used to sort individual R1 and R2 populations (>93% purity) for RNA extraction, cDNA synthesis, and quantitative PCR (qPCR) analysis. Chemotaxis of MDSCs was measured using 24-well Transwell plates with an 8-μm pore size (Corning, catalog no. 3422). The test supernatant or medium was added to the bottom chamber and 1 × 106 BM hematopoietic cells were added to the top chamber. Samples were incubated at 37°C for 2 h in a 5% CO2 incubator. Cells from the bottom chamber were harvested, stained, and then analyzed using flow cytometry. Preferential chemotaxis of myeloid cells was calculated by comparing the fold change in the number of events of each myeloid cell subpopulation normalized to the complete media alone. Cell-free ascites collected from reovirus-treated or nontreated tumor-bearing animals was evaluated with Ab-based Quantibody Cytokine Arrays (RayBiotech, Norcross, GA). For this evaluation, a custom array containing Abs against GM-CSF, G-CSF, M-CSF, VEGF, SCF, MCP-1, SDF-1α, IL-10, IL-12p70, IL-13, IL-6, IFN-γ, IL-1β, TNF-α, RANTES, MIP-1α, IL-8, and MIG was designed and implemented. The suppressive nature of MDSCs and the tumor microenvironment was quantified by monitoring their ability to suppress T cell proliferation and the inhibition of IFN-γ production. T cell proliferation was examined using a CFSE-based cell proliferation assay, as previously described (38). For this, CFSE-labeled T cells were cultured in the presence of MDSCs and simultaneously activated using anti-CD3 and anti-CD28 Abs for 48 h and then analyzed for the halving of CFSE fluorescence. The cell division index is defined as the percentage of cells with halved CFSE fluorescence after stimulation divided by halved CFSE fluorescence cultured in medium only. T cell suppression is defined as 100% percent minus the percentage of T cell proliferation (controls being 100% proliferation) for the respective treatment. To monitor the MDSC-mediated suppression of IFN-γ production, T cells from naive mice were activated by anti-CD3 and anti-CD28 Abs in the presence of the indicated ratio of isolated R1 or R2 myeloid cell populations. At 18 h following T cell stimulation, the cells were treated with Brefeldin A (B7651; Sigma-Aldrich, St. Louis, MO) and incubated for an additional 6 h prior to intracellular and extracellular staining for IFN-γ and T cell markers (CD3 and CD8), respectively. The percentage of CD3+, CD8+, and IFN-γ+ was analyzed via flow cytometry, and the IFN-γ response was calculated as a fold change compared with the respective positive control (without the addition of MDSCs). RNA extractions were conducted using standard TRIzol methodology. Extracted RNA was quantified, diluted to a total of 2 μg, and synthesized into cDNA using SuperScript II (Invitrogen, Burlington, ON, Canada). The Stratagene MX3000P PCR machine was used for qPCR, using GoTaq qPCR Master Mix (Promega, Madison, WI) according to the manufacturer’s instructions for amplification and quantification. Gene-specific primers for murine ARG-1, CCL2, CCR2, CXCR1, CXCR2, GAPDH, IFN-γ, IL-1β, IL-6, IL-10, inducible NO synthase (iNOS), S100A8, S100A9, SDF-1, TGF-β, and VEGF were purchased from Invitrogen. The data from the qPCR were collected and analyzed using Livak and Schmittgen’s 2−ΔΔCT method (39). The fold change was calculated by first normalizing the cycle threshold (ct) of the indicated gene against GAPDH, followed by a comparison against the respective controls. Flow cytometry data were collected using a FACSCalibur flow cytometer (BD Biosciences), and analysis was conducted with the use of CellQuest Pro (BD Biosciences) and FCS Express V3 software (DeNovo Software, Los Angeles, CA). One-way ANOVA with a Bonferroni posttest or a two-tailed Student t test with 95% confidence interval was used for statistical analysis, and p < 0.05 was considered significant. The p values were represented as follows: ns = p > 0.05, *p ≤ 0.05, **p ≤ 0.01, and ***p ≤ 0.001. Our recent studies have demonstrated that the therapeutic administration of reovirus in ovarian cancer–bearing hosts with PC causes a transient accumulation of CD11b+ cells within the ascites and spleen at 3 d post–first injection (d.p.f.i.) (17, 18). Considering the fact that such myeloid cells could consist of a heterogeneous population of cells with differential suppressive capacities, we first characterized the phenotypic heterogeneity of reovirus-induced myeloid cells in cancer-bearing hosts. To perform this study, immunocompetent C57BL/6 mice were i.p. injected with ID8 cells and allowed to develop PC (∼4–6 wk). Once PC was visible, mice were either treated with a therapeutic regimen of reovirus (reo-treated group) or left untreated (nontreated group), per the schematic shown in Fig. 1A. Next, single-cell suspensions from ascites, solid tumors spread in the peritoneal cavity, and spleen were prepared from respective groups and analyzed for the surface expression of CD11b, GR1.1 (Gr-1), and Ly6C at 1 d.p.f.i., 3 d.p.f.i., and 7 d.p.f.i. Therapeutic injection of reovirus in PC-bearing hosts induced significantly higher frequencies of CD11b+, Gr-1+ cells as early as 1 d.p.f.i., which persisted further at 3 d.p.f.i. within ascites and spleen (Fig. 1B, 1C) as compared with those seen in nontreated animals. Of interest, a statistically significant increase in the numbers of CD11b+, Gr-1+ cells was also observed in the solid tumor masses spread through the peritoneal cavity at 1 d.p.f.i. These elevated levels of CD11b+, Gr-1+ cells subsequently subsided at 7 d.p.f.i. in all three tissues tested. These data showed that the injection of oncolytic reovirus induces accumulation of putative CD11b+, Gr-1+ MDSCs in the local tumor microenvironment as well as in systemic immune organs as early as 1 d post injection. Oncolytic reovirus promotes local and systemic accumulation of CD11b+, Gr-1+ cells as early as 1 d post therapeutic administration. (A) C57BL/6 mice were first injected with 3 × 106 ID8 cells, allowed to develop PC, and then treated with a therapeutic regimen of reovirus (5 × 108 PFU per injection) at indicated time points. The frequency of total CD11b+, Gr-1+ cells (B and C) in the single-cell suspensions collected from ascites, tumor, and spleen were evaluated over the course of therapy [nontreated (NT), 1 d.p.f.i., 3 d.p.f.i., and 7 d.p.f.i.] using flow cytometry analysis. Data are representative of more than eight independent experiments. Statistical analysis was performed using one-way ANOVA with a Bonferroni posttest. Asterisks shown immediately on top of the bars signify the p values obtained by comparing the respective data against the nontreated control group. Each column is the mean ±SD of n = 5. ns = p > 0.05, *p ≤ 0.05, ***p ≤ 0.001. Next, we dissected the phenotypic heterogeneity of the CD11b+, Gr-1+ population. Considering that simultaneous analysis of Ly6C on CD11b+, Gr-1+ cells allows for further subfractionation of the putative MDSC populations, a panel of anti-CD11b, anti-Gr-1, and anti-Ly6C Abs was employed to delineate the lineage and phenotypic diversity of reovirus-driven myeloid cells. As illustrated in Fig. 2A and Supplemental Fig. 1C and summarized in Fig. 2B, single-cell suspensions from ascites, tumor, and spleen collected from reovirus-treated or nontreated animals were first gated on CD11b+ cells and then analyzed for the expression of Gr-1 and Ly6C markers. Of interest, most of the myeloid cells present in nontreated, control tumor-bearing animals bear a distinct CD11b+, Gr-1+, Ly6Clow cell phenotype (denoted as R1). However, immediately following the injection of reovirus, especially at 1 d.p.f.i. and 3 d.p.f.i., myeloid cells from ascites, tumor, and spleen displayed a predominant population of CD11b+, Gr-1+, Ly6Chigh cell phenotype (denoted as R2), which was almost absent in nontreated, tumor-bearing animals. Although the levels of this R2 population gradually declined at ∼7 d.p.f.i., especially in ascites and spleen, an additional population with a CD11b+, Gr-1−, Ly6C+ phenotype (denoted as R3) became apparent at 7 d.p.f.i. in all the tested tissues. It should be noted that the levels of CD11b+, Gr-1+, Ly6Clow (R1) cells remain relatively constant throughout the course of oncotherapy, as compared with those observed in nontreated animals (except for 7 d.p.f.i., when ascites shows a slight decrease in the number of the R1 population). Phenotypically distinct heterogeneous subpopulations of CD11b+ myeloid cells accumulate in the tumor microenvironment during the early phase of reovirus oncotherapy. (A) C57BL/6 mice were treated according to the schematic illustrated in Fig. 1A, and CD11b+, Gr-1+ myeloid cells in single-cell suspensions collected from ascites, tumor, and spleen subsets [(A and B) and Supplemental Fig. 1C] were further analyzed for the expression of Ly6C markers throughout the early phase of therapy [nontreated (NT), 1 d.p.f.i., 3 d.p.f.i., and 7 d.p.f.i.] via flow cytometry analysis. Data are representative of more than eight independent experiments. Statistical analysis was conducted using one-way ANOVA followed by a Bonferroni posttest. Asterisks shown immediately on top of the bars signify the p values obtained by comparing the respective data against the nontreated control group. Each column represents the mean ±SD of n = 5. ns = p > 0.05, *p ≤ 0.05, **p ≤ 0.01, ***p ≤ 0.001. Taking into account the fact that apart from the LyC epitope the Gr-1 Ag also contains the epitope for Ly6G, we also considered a staining combination aimed at the simultaneous analysis of CD11b, Gr-1, and Ly6G (and Ly6C) markers on the myeloid cells. In line with previous reports (40), we found that the anti–Gr-1 mAb (clone RB6-8C5) blocks the binding of the anti-Ly6G Ab (clone 1A8) (Supplemental Fig. 2A). This observation restricted the use of anti-Ly6G (clone 1A8) in combination with anti–Gr-1 Ab (clone RB6-8C5) in this study. However, it should be noted that, when anti-Ly6G Ab is combined with anti-CD11b and anti-Ly6C Abs, the predominant tumor-associated myeloid cells from the nontreated tumor-bearing animals are positive for Ly6G (CD11b+, Ly6G+, Ly6Clow; referred to as S1) (Supplemental Fig. 2B). In contrast, reovirus treatment in these tumor-bearing animals induces the accumulation of CD11b+, Ly6G−, Ly6Chigh myeloid cells (indicated as S3) at 1 d.p.f.i., which persists throughout the observation period. However, owing to the incompatibility between the anti–Gr-1 and anti-Ly6G Abs, the Ly6C and Ly6G staining combination fails to concretely differentiate between the R2 and R3 subpopulations achieved through the Gr-1 and Ly6C combination. Hence, this study mainly used the combination of anti-CD11b, anti–Gr-1, and anti-Ly6C Abs to characterize various subpopulations of myeloid cells. Thus, the reovirus-driven myeloid cells in systemic and localized tissues consist of a phenotypically heterogeneous population of cells that comprises mostly newly occurring CD11b+, Gr-1+, Ly6Chigh (R2) and CD11b+, Gr-1−, Ly6C+ (R3) cells. Various subpopulations of myeloid cells demonstrate a plastic phenotype and are known to differentiate from the common progenitors present in BM. Hence, we next wanted to dissect the effect of reovirus on the differentiation of various subpopulations of myeloid cells from hematopoietic progenitor cells in the context of the tumor microenvironment. For this purpose, cell-free ascitic fluid from either reovirus-treated or nontreated tumor-bearing mice was collected throughout the course of the in vivo experiment (performed as in Fig. 1A) and cultured with BM progenitor cells collected from naive syngeneic mice. As illustrated in Fig. 3A and summarized in Fig. 3B, we observed that the BM progenitor cells cultured in the presence of the ascitic fluid collected from nontreated tumor-bearing animals displayed a significantly higher number of CD11b+, Gr-1+, Ly6Clow cells (R1 in Fig. 3A) and a lower frequency of CD11b+, Gr-1−, Ly6C+cells (R3 in Fig. 3A), compared with those cultured without any ascites (nontreated control). More importantly, and in correlation with our in vivo data, the ascites from nontreated PC-bearing animals did not promote the generation of CD11b+, Gr-1+, Ly6Chigh cells (R2 in Fig. 3A). 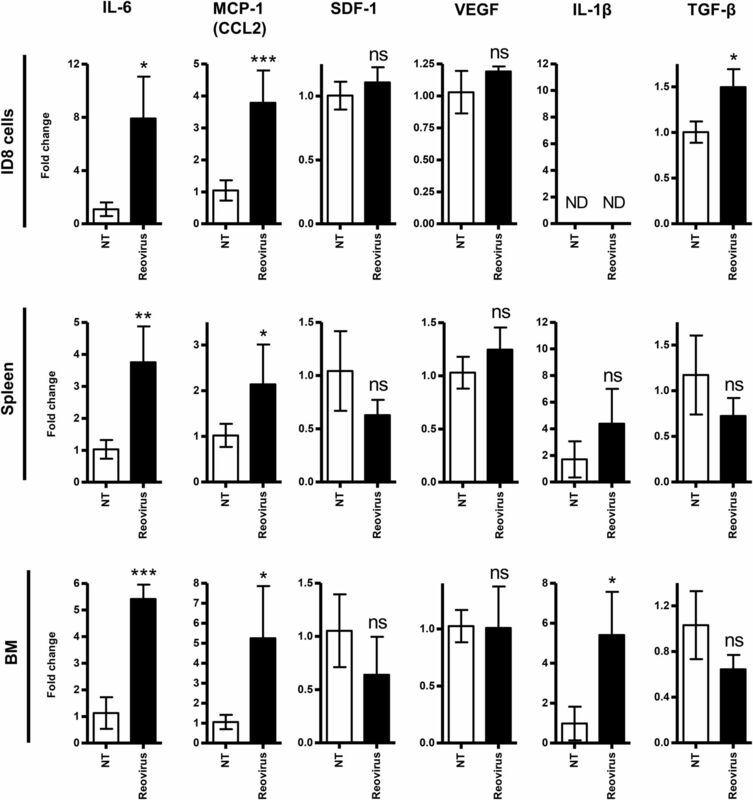 These data show that ascites from ovarian cancer–bearing animals can selectively promote or support the differentiation of CD11b+, Gr-1+, Ly6Clow (R1), but not of CD11b+, Gr-1+, Ly6Chigh (R2) or CD11b+, Gr-1−, Ly6C+ (R3) myeloid cell subpopulations. In contrast, the incubation of BM cells with the ascites from reovirus-treated PC-bearing animals collected at 1 and 3 d.p.f.i. induced a significant increase in the frequency of CD11b+, Gr-1+, Ly6Chigh (R2) cells. Interestingly, BM cells treated with the ascitic fluid from nontreated as well as reovirus-treated (collected at 1, 3, and 7 d.p.f.i.) animals were unable to recover the loss in CD11b+, Gr-1−, Ly6C+ (R3) cells, which was evident when the numbers were compared with those observed in nontreated ascites-treated BM. The reovirus-modulated tumor microenvironment selectively promotes the differentiation of CD11b+, Gr-1+, Ly6Chigh (R2) myeloid cells from BM progenitors. (A and B) BM cells collected from naive C57BL/6 were incubated with the cell-free ascitic fluid that was collected at the indicated collection points from PC-bearing, reovirus-treated, or nontreated (NT) animals. After 24 h, cells were analyzed for the frequency of each of the three CD11b+ cell subsets—CD11b+, Gr-1+, Ly6Clow (R1), CD11b+, Gr-1+, Ly6Chigh (R2), and CD11b+, Gr-1−, Ly6C+ (R3)—by flow cytometry. The data are representative of three to five independent experiments. One-way ANOVA with a Bonferroni posttest was conducted for statistical analysis. Asterisks immediately above the bars signify the p values obtained by comparing the respective data against the nontreated control group; asterisks shown above the horizontal lines display the p values obtained through comparison of the groups containing individual time points. The data are represented as the mean ± SD of n = 3–5. ns = p > 0.05, *p ≤ 0.05, **p ≤ 0.01, ***p ≤ 0.001. Collectively, these data illustrate that the tumor microenvironment of nontreated PC-bearing animals promotes the differentiation of CD11b+, Gr-1+, Ly6Clow (R1) cells and reduces the frequencies of CD11b+, Gr-1−, Ly6C+ (R3) cells. The most remarkable observation, however, is that the reovirus-modulated tumor microenvironment selectively promotes the generation of CD11b+, Gr-1+, Ly6Chigh (R2) cells, especially during early phases of oncotherapy (at 1 and 3 d.p.f.i.). Taking this into consideration, we mainly focused on the CD11b+, Gr-1+, Ly6Chigh (R2) cell subpopulation in our subsequent investigations. Reovirus is known to affect the functions and phenotype of various immune cells via direct interaction or through the products of oncolytic activities on cancer cells (15, 16, 41). Therefore, we next asked whether reovirus itself or reovirus-mediated oncolysis can affect the differentiation of BM cells in various myeloid subpopulations. To this end, BM hematopoietic progenitors cocultured in the presence or absence of ID8 cells were either treated with reovirus (10 multiplicity of infection [MOI]) or left alone for 24 h, and then analyzed for the expression of CD11b, Gr-1, and Ly6C. As illustrated in Fig. 4A and summarized in Fig. 4B, BM cells cultured without ID8 cells and then exposed to reovirus displayed increased frequencies of CD11b+, Gr-1+, Ly6Chigh (R2) cells with no significant increase in the percentages of CD11b+, Gr-1+, Ly6Clow (R1) or CD11b+, Gr-1−, Ly6C+ (R3) cells, compared with those cultured in the absence of reovirus. 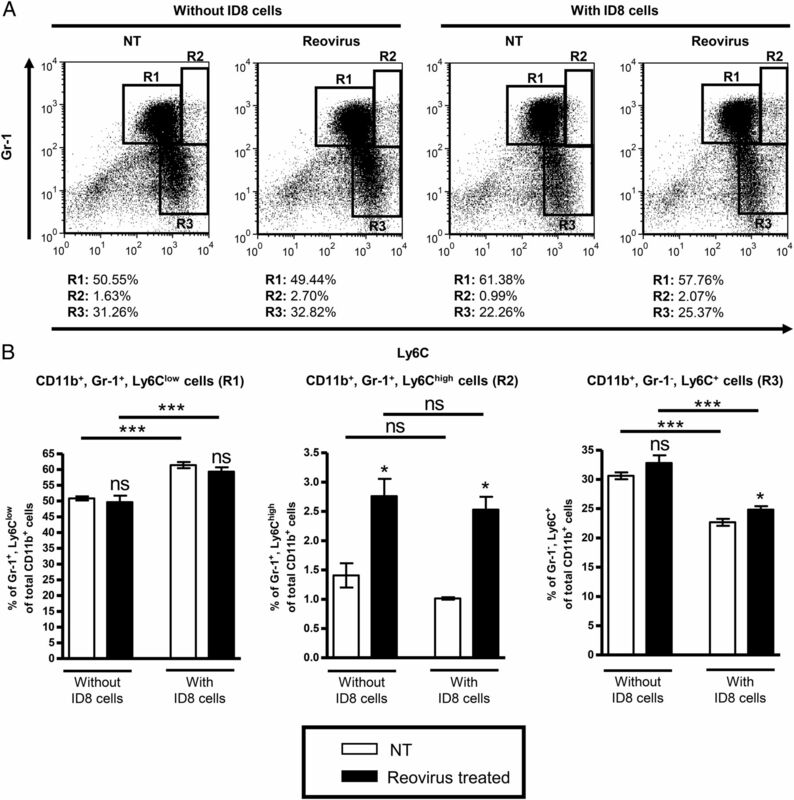 These data demonstrate that reovirus itself can drive the differentiation of CD11b+, Gr-1+, Ly6Chigh (R2) myeloid cells, and that this process does not require the products of oncolysis. In contrast, the addition of ID8 cells cultured in the presence of BM cells and in the absence of reovirus showed higher frequencies of CD11b+, Gr-1+, Ly6Clow (R1) cells; lower numbers of CD11b+, Gr-1−, Ly6C+ (R3) cells; and unchanged frequencies of CD11b+, Gr-1+, Ly6Chigh (R2) cells. In line with our in vivo data (Fig. 3), these data further suggest that cancer cells promote the preferential differentiation of the CD11b+, Gr-1+, Ly6Clow (R1) subpopulation from BM progenitors. Of interest, when BM cells were cocultured with reovirus-infected ID8 cells, significantly higher frequencies of CD11b+, Gr-1+, Ly6Chigh (R2) and, to a lesser extent, of CD11b+, Gr-1−, Ly6C+ (R3), and lowered frequencies of CD11b+, Gr-1+, Ly6Clow (R1) cell populations were evident, compared with those cocultured with nontreated ID8 cells. Collectively, these findings demonstrate that reovirus, either on its own or through the modulation of the tumor microenvironment, promotes a selective differentiation of CD11b+, Gr-1+, Ly6Chigh (R2) myeloid cells from BM hematopoietic progenitors, independent of oncolysis. Reovirus selectively drives the differentiation of CD11b+, Gr-1+, Ly6Chigh (R2) myeloid cells from BM progenitors independent of oncolysis. (A and B) ID8 tumor cells were treated with reovirus (10 MOI) for 24 h and then cocultured with BM cells collected from naive C57BL/6 mice for an additional 24 h. Next, cultures were harvested and analyzed for the frequencies of respective myeloid cell subsets using flow cytometry. These data are representative of three to five independent experiments. Statistical analysis was performed using one-way ANOVA with a Bonferroni posttest. Asterisks shown immediately on top of the bars represent the p values obtained by comparing the respective data against the nontreated (NT) control group. Asterisks above the horizontal lines display the p values obtained from the comparison of the groups containing individual time points. The data are represented as the mean ±SD of n = 3–5. ns = p > 0.05, *p ≤ 0.05, ***p ≤ 0.001. The dynamics of myeloid cell differentiation, survival, recruitment, and accumulation are dictated by various immune mediators, commonly known as pro-MDSC factors. Therefore, we next conducted a protein and gene expression analysis of well-known pro-MDSC factors in systemic (blood or spleen) as well as local (ascites and tumor) microenvironments. For this purpose, first the cell-free ascitic fluid and blood from reovirus-treated or nontreated PC-bearing hosts were collected at 1, 3, and 7 d.p.f.i., and analyzed using the Ab-based quantitative cytokine array to determine the levels of soluble pro-MDSC factors (22, 42, 43) (as listed in Supplemental Table I). As shown in Fig. 5, ascitic fluid from reovirus-treated animals contained significantly higher amounts of IL-6, G-CSF, MCP-1 (CCL2), MCP-5 (CCL12), and RANTES (CCL5) at 1 and 3 d.p.f.i., compared with those observed in ascites from nontreated PC-bearing animals. Similar trends were also observed for the expression of IL-6, MCP-1 (CCL2), and MCP-5 (CCL12) in the blood samples. These elevated levels of MCP-1, MCP-5 (for both ascites and blood), and G-CSF (for ascites only) were also maintained at 7 d.p.f.i., whereas significantly higher levels of TNF-α were evident on 1 and 7 d.p.f.i. in the ascitic fluid. Interestingly, the levels of VEGF, a known growth factor for MDSCs, were elevated at 1 and 7 d.p.f.i. in blood and decreased in ascites at 7 d.p.f.i. Unlike for the above-listed pro-MDSC factors, there was no significant change in the levels of CXCL16, GM-CSF, IL-10, IL-1β, M-CSF, SCF, or SDF-1α (Supplemental Table I). These data suggest that the recruitment and accumulation of CD11b+, Gr-1+, Ly6Chigh (R2) myeloid cells are concomitant with the elevated levels of numerous pro-MDSC factors in the local and systemic milieu of reovirus-treated cancer-bearing hosts. Preferential recruitment of CD11b+, Gr-1+, Ly6Chigh (R2) cells in the tumor milieu is accompanied by enhanced quantities of pro-MDSC proteins in the ascites and blood. PC-bearing C57BL/6 mice were treated according to Fig. 1A, and cell-free ascitic fluid and blood, collected at the indicated time points, were analyzed using an Ab-based quantitative cytokine array to measure the concentrations of selected mouse cytokines. Data are representative of three independent experiments. Statistical analysis was performed using one-way ANOVA coupled with the Bonferroni posttest. Asterisks shown immediately on top of the bars signify the p values obtained by comparing the respective data against the nontreated (NT) control group. ns = p > 0.05, *p ≤ 0.05, **p ≤ 0.01, ***p ≤ 0.001. To further pinpoint the source of these pro-MDSC factors, qPCR was conducted on the cells collected from ascites, tumor, and spleen of reovirus-treated or nontreated PC-bearing animals for gene expression analysis (Fig. 6). In correlation with the cytokine array data, the overall expression levels of IL-6 and MCP-1 (CCL2) as well as TGF-β, which was not covered in the cytokine array, were significantly upregulated in the cell constituents of the ascitic fluid collected early during reovirus oncotherapy as compared with those collected from the nontreated PC-bearing animals. Contrary to the cytokine array data, qPCR analysis of IL-1β showed a significant increase in expression within the ascites and the tumor at 3 and 7 d.p.f.i., respectively. Surprisingly, the elevated expression of these pro-MDSC factors was mostly observed in the samples collected from ascites and not from tumor or spleen, suggesting that the likely source of these immune mediators is the cells of the ascites. Reovirus-driven accumulation of CD11b+, Gr-1+, Ly6Chigh (R2) cells is concurrent with increased gene expression of pro-MDSC factors. Cells from the ascites, tumor, and spleen of the control or reovirus-treated PC-bearing C57BL/6 mice (injected as in Fig. 1A) were collected at the indicated time points and were analyzed using qPCR to measure the expression of various immune markers known to be involved in MDSC pathophysiology (as denoted on the top of each bar graph). Data were analyzed following Livak and Schmittgen’s 2−ΔΔCT methodology (39). Graphs illustrate the fold change normalized to its own GAPDH and compared against the respective nontreated (NT) control. Data are representative of three to five independent experiments. One-way ANOVA coupled with a Bonferroni posttest was performed. Asterisks shown immediately on top of the bars signify the p values obtained by comparing the respective data against the NT control group. ns = p > 0.05, *p ≤ 0.05, **p ≤ 0.01, ***p ≤ 0.001. The ascites of PC-bearing hosts is known to contain a mixture of cancer and infiltrating immune cells (44). Thus, to ascertain the contribution of each subset in question, tumor (ID8) cells, BM progenitors, and lymphoid cells from spleen were separately cultured in the presence or absence of reovirus in vitro for 24 h, and then analyzed for the gene expression of various pro-MDSC factors, using qPCR (Fig. 7). In accordance with our in vivo and ex vivo data, ID8 cells, BM, and spleen cells treated with reovirus showed significantly higher expression of IL-6 and MCP-1, compared with that observed in nontreated cells. Analysis of other pro-MDSC factors, such as VEGF and SDF-1, showed no significant change in expression following reovirus treatment. Compared with respective nontreated controls, a significant increase in TGF-β and IL-1β expression was observed only in reovirus-treated ID8 and BM cells, respectively. Collectively, these data suggest that ID8, BM, and splenocytes are all potentially responsible for the increased expression of multiple pro-MDSC factors following an exposure to reovirus. However, the expression of certain pro-MDSC factors such as IL-1β or TGF-β could be generated from the infiltrating BM originating cells or cancer cells, respectively. Taken together, these data demonstrate that reovirus can act on either cancer or immune cells and induce the production of pro-MDSC factors, in local and systemic milieu, that are capable of supporting growth, differentiation, and recruitment of myeloid cells. Reovirus can mediate the production of pro-MDSC factors from cancer cells as well as immune cells. 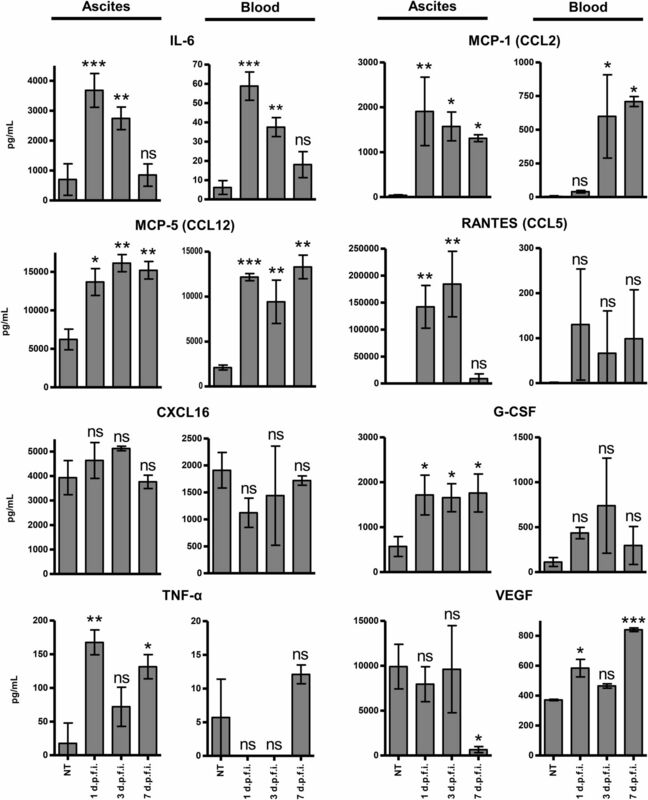 In vitro cultured ID8 cells, harvested spleen, or BM cells were cultured with or without reovirus (10 MOI) for 24 h and then analyzed with qPCR for the expression of IL-6, MCP-1, VEGF, SDF-1, IL-1β, and TGF-β coupled with data analysis as explained in Fig. 6. Data are representative of three independent experiments. Statistical analysis was conducted using a two-tailed Student t test with 95% confidence interval. Asterisks immediately on top of the bars signify the p values obtained by comparing the respective data against the nontreated (NT) control group. ns = p > 0.05, *p ≤ 0.05, **p ≤ 0.01, ***p ≤ 0.001. ND, signal was not detected. To further understand the mechanism by which myeloid cells accumulate in the tumor microenvironment, we asked whether reovirus promoted selective chemotaxis of any of the myeloid subpopulations CD11b+, Gr-1+, Ly6Clow (R1), CD11b+, Gr-1+, Ly6Chigh (R2), or CD11b+, Gr-1−, Ly6C+ cells (R3) in question. To answer this, a standard Transwell chemotaxis assay was performed. For this purpose, BM cells from naive C57BL/6 mice were added in the top chamber, and cell-free ascites samples from either reovirus-treated or nontreated PC-bearing mice collected at indicated time points were placed in the bottom chamber of the Transwell system. Following a 2-h incubation, the cells that had migrated into the bottom chamber were evaluated for their respective myeloid subpopulation phenotype. As shown in Fig. 8A, the migration of either CD11b+, Gr-1+, Ly6Clow (R1) or CD11b+, Gr-1−, Ly6C+ (R3) cells remains unchanged in the presence of ascitic fluid collected from either reovirus-treated or nontreated animals. It should, however, be noted that the CD11b+, Gr-1+, Ly6Clow (R1) population migrates at a significantly higher rate in the presence of ascites than when cultured in media alone. Most importantly, ascitic fluid collected at 1 d.p.f.i. from reovirus-treated PC-bearing animals exclusively promotes significantly greater chemotaxis of the CD11b+, Gr-1+, Ly6Chigh (R2) subpopulation compared with ascitic fluid from nontreated animals or media alone. To further investigate this selective migratory potential, the expression of chemotactic receptors (CXCR1, CXCR2, and CCR2) in isolated CD11b+, Gr-1+, Ly6Clow (R1) and CD11b+, Gr-1+, Ly6Chigh (R2) subpopulations was assessed throughout the course of therapy (Fig. 8B). Such comparative analysis illustrated that the CD11b+, Gr-1+, Ly6Clow (R1) population had significantly greater expression of CXCR1 and CXCR2, whereas the CD11b+, Gr-1+, Ly6Chigh (R2) population contained greater expression of CCR2. Of note, the cytokine array data (Fig. 5) showed significantly elevated expression of chemotactic MCP-1 (CCL2), known to support such trafficking, at 1 d.p.f.i. In addition, we also found heightened gene expression of S100A8 and S100A9 proteins, known to drive the chemotaxis of CD11b+ cells, in the cells collected from the ascites of reovirus-treated PC-bearing animals (Supplemental Fig. 3). 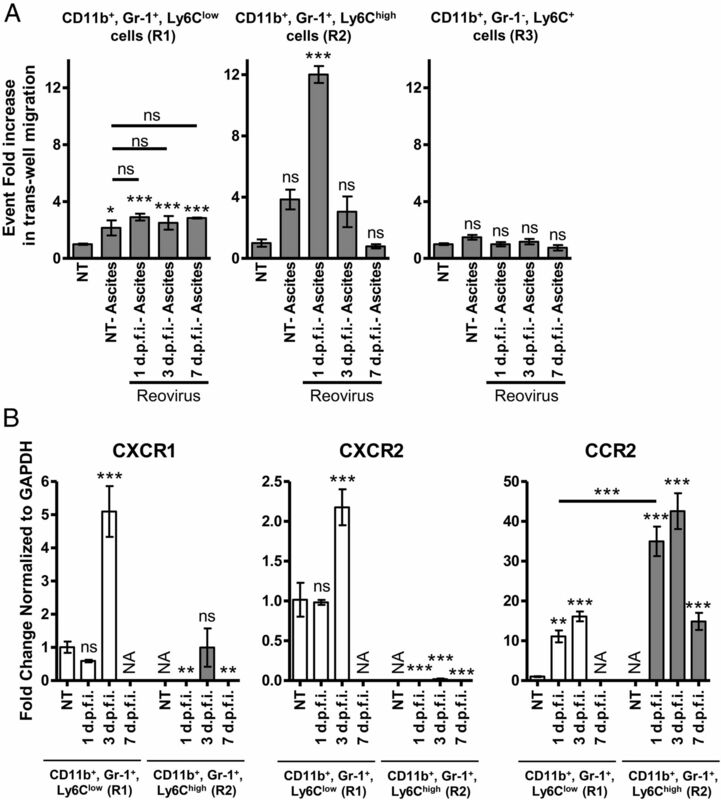 These data clearly demonstrate that reovirus modulates the tumor-associated microenvironment and drives selective chemotaxis of CD11b+, Gr-1+, Ly6Chigh (R2) cells exclusively during the early phase of oncotherapy, and explain the mechanism by which these cells accumulate in the tumor microenvironment. Reovirus-modulated tumor milieu promotes selective migration of CD11b+, Gr-1+, Ly6Chigh (R2) cells. (A) Cell-free ascitic fluid was collected from the nontreated (NT) or reovirus-treated PC-bearing C57BL/6 mice (treated as in Fig. 1A) and was placed in the bottom chamber of an 8-μm Transwell plate. BM cells (1 × 106 cells) from naive C57BL/6 mice were seeded in the upper chamber of the same Transwell plate and allowed to migrate to the bottom chamber. After 2 h, flow cytometry analysis monitored the frequencies of CD11b+, Gr-1+, Ly6Clow (R1), CD11b+, Gr-1+, Ly6Chigh (R2), and CD11b+, Gr-1−, Ly6C+ (R3) cells that migrated into the bottom chamber. (B) C57BL/6 mice were injected as in the schematic in Fig. 1A, and the CD11b+, Gr-1+, Ly6Clow (R1) and CD11b+, Gr-1+, Ly6Chigh (R2) cell populations were isolated, via fluorescent cell sorting. qPCR was conducted on cDNA synthesized from the RNA extracted from isolated CD11b+, Gr-1+, Ly6Clow (R1) and CD11b+, Gr-1+, Ly6Chigh (R2) populations to measure the expression of known myeloid cell chemotactic receptors (CXCR1, CXCR2, CCR2). NA indicates that sufficient sample could not be recovered for qPCR. Data are representative of four to five mice, and qPCR samples were run in duplicate experiments. A Bonferroni posttest was performed. Asterisks shown immediately on top of the bars signify the p values obtained by comparing the respective data against the nontreated CD11b+, Gr-1+, Ly6Clow (R1) control group. ns = p > 0.05, *p ≤ 0.05, **p ≤ 0.01, ***p ≤ 0.001. Tumor-associated myeloid cells are known to inhibit various immune responses, especially those mediated by T cells. Considering the critical role of T cell responses in OV-driven anti-cancer immunotherapy, ultimately we investigated the T cell suppression capacities of the reovirus-driven heterogeneous myeloid cell populations. For this purpose, C57BL/6 mice were injected with ID8 tumor cells and subsequently treated with the therapeutic regimen of reovirus per the schematic shown in Fig. 1A. At the indicated time points, cells from ascitic fluid were collected and then passed through an Ab-based myeloid cell isolation column to obtain purified CD11b+, Gr-1+ cells (a purity >90%; Supplemental Fig. 1A), containing both the CD11b+, Gr-1+, Ly6Clow (R1) and CD11b+, Gr-1+, Ly6Chigh (R2) populations. These cells were then analyzed for their capacity to suppress T cell proliferation. As shown in Fig. 9A, CD11b+, Gr-1+ cells collected at 1 and 3 d.p.f.i. showed significantly higher potency to inhibit T cell proliferation at 1:4 E:T ratio than the cells collected at 7 d.p.f.i or those collected from nontreated PC-bearing animals. Of note, CD11b+, Gr-1+ cells collected at 7 d.p.f.i. displayed suppressive capacities comparable to those observed in the cells from nontreated animals. These data demonstrate that CD11b+, Gr-1+ cells present in the tumor microenvironment of reovirus-treated PC-bearing animals have higher capacity to suppress T cell activation than do those collected from nontreated PC-bearing animals, especially at 1 and 3 d.p.f.i. during oncotherapy. Augmented tumor-associated immunosuppression during the early phase of reovirus oncotherapy is mediated by newly recruited CD11b+, Gr-1+, Ly6Chigh (R2) myeloid cells. PC-bearing C57BL/6 mice were treated according to Fig. 1A. Total CD11b+, Gr-1+ cells (A) or isolated subpopulations of CD11b+, Gr-1+, Ly6Clow (R1) and CD11b+, Gr-1+, Ly6Chigh (R2) cells (B) were incubated with activated T cells (via CD3 and CD28 Abs) at the indicated MDSC/splenocyte ratio. Activated T cells were harvested from syngeneic naive mice and stained with CFSE or monitored for an IFN-γ response from CD8+ T cells. (A and B) After 96 h, cells were stained with anti-CD3 Abs and then analyzed by flow cytometry for CFSE fluorescence halving of CD3+ cells to determine the percentage of T cell suppression. (C) After 18 h post T cell activation, cells were treated with Brefeldin A and incubated for an additional 6 h. Flow cytometry was conducted to monitor an IFN-γ response via extracellular and intracellular staining for T cell markers (CD3 and CD8) and IFN-γ, respectively. (D) C57BL/6 mice were treated according to Fig. 1A, and CD11b+, Gr-1+, Ly6Clow (R1) and CD11b+, Gr-1+, Ly6Chigh (R2) cell populations were isolated via fluorescent cell sorting. qPCR was conducted on the RNA extracted and cDNA synthesized from CD11b+, Gr-1+, Ly6Clow (R1) and CD11b+, Gr-1+, Ly6Chigh (R2) isolated populations to measure the expression of ARG-1, iNOS, IL-10, and TGF-β, using gene-specific primers. All values were normalized to the internal control (GAPDH). NA indicates that sufficient sample could not be recovered for qPCR. (E) Cell-free ascitic fluid from nontreated (NT) or reovirus-treated animals was analyzed using the Ab-based quantitative cytokine array to measure mouse cytokine concentrations of IFN-γ. Statistical analysis was performed using one-way ANOVA with a Bonferroni posttest. Asterisks shown immediately alongside the horizontal bars signify the p values obtained by comparing the respective data; asterisks above the bars are representative of the p values obtained by comparing against the respective control. Data are representative of the mean ±SD at n = 4–6. ns = p > 0.05, *p ≤ 0.05, **p ≤ 0.01, ***p ≤ 0.001. To pinpoint the contribution of each constituent subpopulation, we subfractionated the CD11b+, Gr-1+ cells into CD11b+, Gr-1+, Ly6Clow (R1) and CD11b+, Gr-1+, Ly6Chigh (R2) subpopulations (a purity between 91 and 96%; Supplemental Fig. 1B), and analyzed their respective T cell suppressive capabilities to hamper proliferation and cytotoxicity (IFN-γ response). As shown in Fig. 9B, newly recruited CD11b+, Gr-1+, Ly6Chigh (R2) cells displayed an enhanced suppression capacity that was significantly higher than that observed with the CD11b+, Gr-1+, Ly6Clow (R1) cell population collected from nontreated PC-bearing animals. Of interest, both CD11b+, Gr-1+, Ly6Clow (R1) and CD11b+, Gr-1+, Ly6Chigh (R2) cell populations from reovirus-treated mice contained comparable suppressive capacities. Similar to the proliferation data, both the CD11b+, Gr-1+, Ly6Clow (R1) and CD11b+, Gr-1+, Ly6Chigh (R2) subpopulations have an enhanced capability to suppress IFN-γ production from CD8+ T cells at 1 and 3 d.p.f.i., whereas the CD11b+, Gr-1+, Ly6Clow (R1) myeloid cell population collected from nontreated animals or isolated at 7 d.p.f.i. has no effect on IFN-γ production. Of note, the CD11b+, Gr-1+, Ly6Chigh (R2) population promotes IFN-γ production at 7 d.p.f.i. To complement such an increase in immunosuppression at 1 d.p.f.i. and 3 d.p.f.i., qPCR analysis of isolated CD11b+, Gr-1+, Ly6Clow (R1) and CD11b+, Gr-1+, Ly6Chigh (R2) myeloid cell populations illustrated that both CD11b+, Gr-1+, Ly6Clow (R1) and CD11b+, Gr-1+, Ly6Chigh (R2) populations have significantly higher expression of iNOS at 1 d.p.f.i. [although this does decrease in the CD11b+, Gr-1+, Ly6Chigh (R2) population at 3 and 7 d.p.f.i.] and IL-10 at 3 d.p.f.i., compared with the nontreated CD11b+, Gr-1+, Ly6Clow (R1) population (Fig. 9D). In addition, there is also a significant increase in ARG-1 and TGF-β in the CD11b+, Gr-1+, Ly6Chigh (R2) population at 3 d.p.f.i (Fig. 9D). Such factors play a key role in tumor progression but, most importantly, in suppressing T cell function and proliferation. It should be noted that, following reovirus injection, significantly higher numbers of CD11b+, Gr-1+, Ly6Chigh (R2) cells are selectively recruited in the tumor microenvironment (Fig. 8) and constitute the major portion of tumor-associated myeloid cells (Fig. 2A, 2B, and Supplemental Fig. 1C). Especially, the ratio of CD11b+, Gr-1+, Ly6Chigh (R2) to CD11b+, Gr-1+, Ly6Clow (R1) cells during the early phase of oncotherapy is significantly greater than that observed in nontreated animals (as illustrated in Fig. 10). Thus, even though both CD11b+, Gr-1+, Ly6Clow (R1) and CD11b+, Gr-1+, Ly6Chigh (R2) populations bear comparable suppressive capacities, the augmentation of the tumor-associated suppression happens only following the recruitment of CD11b+, Gr-1+, Ly6Chigh (R2) cells. Together, these data suggest that the newly recruited CD11b+, Gr-1+, Ly6Chigh (R2) cells further enhance the tumor-associated immunosuppression at 1 and 3 d.p.f.i. that eventually subsides at 7 d.p.f.i. This conclusion is further supported by the fact that the ascitic fluid from reovirus-treated PC-bearing animals showed significantly higher levels of IFN-γ protein, a signature marker of T cell activation, only at 7 d.p.f.i. (Fig. 9E). Taken together, our data show that reovirus transiently augments tumor-associated immunosuppression during the early phase of oncotherapy, and that this suppression is mediated by newly recruited CD11b+, Gr-1+, Ly6Chigh (R2) cells. Relationship between the kinetics of tumor-associated, MDSC-mediated suppressive activities and the frequencies of myeloid cell subpopulations. In this schematic, the x-axis represents a timeline following reovirus injections, and the y-axis represents the levels of either MDSC-mediated immunosuppressive capacities or the respective frequencies of CD11b+, Gr-1+, Ly6Clow (R1) and CD11b+, Gr-1+, Ly6Chigh (R2) populations. At the beginning of the oncotherapy (time 0 d.p.f.i. 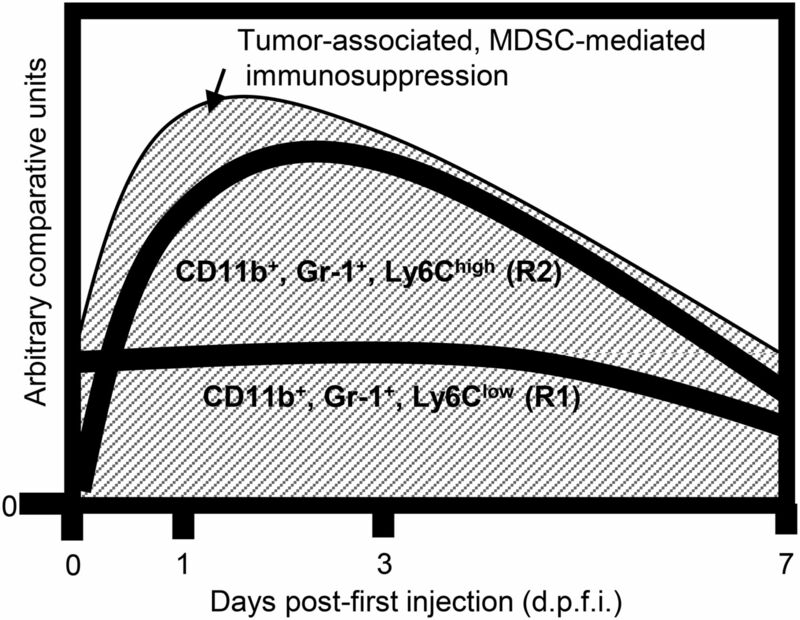 ), tumor-associated, MDSC-mediated suppression (represented by the shaded area) and CD11b+, Gr-1+, Ly6Clow (R1) cells both exist at substantial levels and hence are represented to start at a higher level than “0” on the y-axis. In contrast, CD11b+, Gr-1+, Ly6Chigh (R2) cells are present in minute quantities and are thus represented to start at a lower point than that of CD11b+, Gr-1+, Ly6Clow (R1) cells. Following reovirus injection, the level of MDSC-mediated suppressive activities first gets potentiated at 1 and 3 d.p.f.i. and then returns to pretreatment levels at 7 d.p.f.i. Similar kinetics of appearance is also followed by the CD11b+, Gr-1+, Ly6Chigh (R2) cells. On the contrary, the numbers of CD11b+, Gr-1+, Ly6Clow (R1) cells remain comparatively constant, especially at 1 and 3 d.p.f.i. Collectively, this kinetic analysis shows that MDSC-mediated suppressive capacities follow the kinetics of CD11b+, Gr-1+, Ly6Chigh (R2) cells and further supports a role for CD11b+, Gr-1+, Ly6Chigh (R2) in potentiating the tumor-associated immunosuppression. Anticancer immunotherapies promote the development of anticancer immune responses that are capable of eradicating existing or possibly relapsing cancer cells. However, tumor-associated immunosuppression, present either locally or systemically, hampers the development of such beneficial anticancer immune responses and poses a major impediment to the successful implementation of anticancer immunotherapies. It is now clear that detailed knowledge about the biology and subsequent functional consequences of tumor-associated immunosuppression is essential for achieving the optimum efficacy of any anticancer immunotherapies. In this report, we demonstrate that the therapeutic administration of oncolytic reovirus, which is known to promote beneficial antitumor immunity, transiently augments tumor-associated immunosuppression during the early phase of oncotherapy (Fig. 10). In the context of the highly sought-after anticancer immunotherapeutic activities of OVs, this discovery unearths a biological phenomenon that will further assist the development of strategies aimed at achieving the best possible outcome from OV-based cancer therapies. Immunological events induced following reovirus administration in cancer-bearing hosts concern both antiviral and antitumor immune responses. In the context of reovirus-based oncotherapy, antitumor immune responses are beneficial, whereas antiviral immune responses are detrimental. Thus, to achieve the optimum efficacy of OV-based oncotherapies, therapeutic strategies that can simultaneously promote antitumor immunity while suppressing antiviral immunity are desired. In view of the complex interplay between antitumor and antiviral immunity, OV-driven immunomodulation requires comprehensive dissection to understand its anticancer immunotherapeutic implications. Recent studies have illustrated that the reovirus-mediated immunomodulation overturns tumor-associated immune evasion mechanisms and subsequently initiates a clinically meaningful antitumor immunity (16, 18). Of interest, some of these studies also reported that reovirus drives an accumulation of suppressive cells, such as MDSCs and regulatory T cells, following its therapeutic administration (18). Considering the capacity of reovirus to initiate functional and clinically relevant antitumor immune responses, the accumulation of suppressive cells following its administration is counterintuitive. Similar accumulation of myeloid cells has been reported in other acute infections, including those produced by vaccinia virus, adenovirus, and the acute lymphocytic choriomeningitis virus (31, 36, 45, 46). It is hypothesized that these suppressive cells either protect the infected host against excessive collateral damage by limiting the attack of immune cells on virally infected cells or are recruited by the virus as an immune evasion mechanism to thwart the immune-mediated attack aimed at eliminating the replication niche. In the context of oncotherapy, the presence of these OV-driven suppressive cells—especially during the early phase of oncotherapy, when the antitumor immune responses are primed—is considered to be detrimental. Therefore, this study was focused on understanding the biology, phenotypic heterogeneity, biodiversity, and pathophysiology of reovirus-induced suppressive myeloid cells. Of note, the heterogeneity of MDSCs or IMCs is still obscure, partially owing to the fact that the myeloid cells of differential phenotype are addressed as a singular “MDSC” population. Considering these facts, and in an effort to avoid further confusion, in this article we have defined such putative “MDSCs” simply with their phenotype (for example, CD11b+, Gr-1+/−, Ly6Clow/high myeloid cells). The accumulation of myeloid cells in the tumor microenvironment following exposure to oncolytic reovirus could result from either selective survival or trafficking of a specific subpopulation. Survival of myeloid cells is orchestrated by various survival factors, including IL-6, G-CSF, TNF-α, TGF-β, and IL-1β, that are present in their microenvironment. Thus, in vitro studies aimed at investigating the survival/apoptosis of MDSCs are hampered by the fact that these cells are less amenable to long-term culture conditions, most likely owing to the absence of growth factors in the culture media. Similar to other publications (47, 48), we have found that the harvesting of tumor-associated myeloid cells in standard culture medium causes a large majority of the CD11b+, Gr-1+ cells to spontaneously die within 24 h. However, as suggested by Suzuki et al. (47), the supplementation of culture medium with tumor-bearing mouse plasma, or in our case with cell-free ascitic fluid, reduces the spontaneous apoptosis of tumor-associated MDSCs. This phenomenon has been observed in various mouse cancer models, including those initiated with lung epithelial cells (TC-1 cells; Ref. 47), mammary tumor cells (4T1 cells; Ref. 48), and our ovarian cancer cells (MOSE ID8 cells), suggesting that this is rather a generalized, and not cancer model–specific, phenomenon. We have previously identified that tumor-associated CD11b+, Gr-1+ myeloid cells, now known as CD11b+, Gr-1+, Ly6Clow (R1) myeloid cells, cultured in the medium supplemented by ascitic fluid from a nontreated ovarian cancer–bearing mouse, show a greater number of annexin V+ cells following exposure to reovirus in vitro (17). In this article, we demonstrate that only CD11b+, Gr-1+, Ly6Chigh (R2) myeloid cells, and not CD11b+, Gr-1+, Ly6Clow (R1) myeloid cells, display enhanced chemotactic potential immediately following reovirus therapy. Thus, collectively these results suggest that the reovirus-induced accumulation of myeloid cells in the tumor microenvironment is associated with lower survival of CD11b+, Gr-1+, Ly6Clow (R1) myeloid cells and higher chemotactic potential of CD11b+, Gr-1+, Ly6Chigh (R2) myeloid cells. Many pathological conditions, including infections as well as immunization protocols employing CFA, are known to promote a transient expansion of the IMCs that fail to fully develop into mature MDSCs but still possess immunosuppressive capacities (22, 49). In line with this evidence, we recently discovered that reovirus drives the expansion and accumulation of myeloid cells coexpressing CD11b+ (detected by clone M1/70) and Gr-1+ (detected by clone RB6-8C5) markers following its therapeutic administration in ovarian PC–bearing C57BL/6 mice. However, whether this reovirus-driven putative MDSC population contains a phenotypically and functionally heterogeneous population of myeloid cells or IMCs remains unknown. Such subfractionation of MDSCs is usually done using the combination of the Abs against CD11b, Gr-1, Ly6G and Ly6C markers. However, use of the Ly6G marker in this study was avoided based on the conflicting reports suggesting that the mAb Gr-1 (clone RB6-8C5) blocks the binding of the Ly6G (clone 1A8) Ab (40). Therefore, to maintain continuity with our previous findings, we subdivided myeloid cells in various subgroups based on their CD11b, Gr-1, and Ly6C expression, and focused on CD11b+, Gr-1+, Ly6Clow (R1), CD11b+, Gr-1+, Ly6Chigh (R2), and CD11b+, Gr-1−, Ly6C+ (R3) cells. Biological functions of MDSCs are mediated through a multitude of mechanisms and often have contrasting physiological implications. Although MDSCs were first characterized in tumor-bearing mice and humans (50–52), they were also found to exist in healthy hosts and reported in other pathological conditions, including viral, bacterial, and parasitic infections (32, 46, 49, 53–56). Not surprisingly, the implications for the MDSC-driven suppressive activities are dictated by the health or disease conditions in which they occur. For example, suppressive capacities of the MDSCs found in tumor-bearing hosts or those suffering from chronic viral infections profoundly suppress the functions of immune cells and contribute to the aggravation of the disease condition (53, 54). In contrast, MDSCs developed during autoimmune conditions (e.g., experimental autoimmune encephalomyelitis; Ref. 57) and acute infections (31) are postulated to protect the hosts against self-damaging immune assault by inhibiting the functions of hyperactive immune cells. Hence, the specific role for MDSC-driven suppressive immune activities must be evaluated in the context of the specific health condition. In the context of oncotherapy, it must be kept in mind that the virus-driven myeloid cell accumulation occurs in the simultaneous presence of the two entities that are known to endow MDSCs with contrasting pathophysiological attributes: cancer microenvironment and acute viral infection. Considering that the characterization of MDSCs within the above-mentioned unique, but clinically important, scenario has remained undiscovered, this study was focused on the functional attributes of oncotherapy-driven myeloid cell subpopulations. Only through such special consideration would the pathophysiological importance and possible immunotherapeutic potential of these cells during OV-based oncotherapy be realized. Reovirus-based oncotherapy, similar to other OV-based therapies, is being recognized for its anticancer immunotherapeutic properties. It is now clear that to achieve the optimum efficacy of OV-based therapy, direct oncolytic properties of OVs must be complemented with the immune interventions that can promote OV-driven immunotherapeutic benefits. Whereas most of the efforts to date are focused on understanding the beneficial immunological effects of OV-based therapy, very little attention has been paid to the immunological events that have a capacity to either compromise or negatively affect the efficacy of such therapies. In this article, we illustrate that, in addition to the immunostimulatory properties, reovirus oncotherapy also promotes a transient phase of immunosuppression that is mediated through selective recruitment and accumulation of highly suppressive CD11b+, Gr-1+, Ly6Chigh (R2) cells. In the context of ongoing efforts to supplement OV-based therapies with the complementary interventions aimed at synergistically enhancing its anticancer benefits, identification of such therapeutic targets is extremely advantageous. Strategic management of such immunosuppressive entities can further potentiate OV-driven immunotherapeutic effects and enhance the efficacy of reovirus oncotherapy. Of note, the complementation of reovirus with chemotherapeutic gemcitabine, known to inhibit MDSCs, has been found to postpone the development of disease and prolong survival in ovarian cancer–bearing hosts (17). Thus, the findings reported in this article are of critical importance and can be directly translated in clinical settings to achieve better patient outcomes, especially in the context of ongoing phase III clinical trials. This work was supported by research grants from the Canadian Institute of Health Research and Terry Fox Research Institute (to P.W.K.L.). D.R.C. is funded by studentships from the Nova Scotia Health Research Foundation and the Beatrice Hunter Cancer Research Institute’s Cancer Research Training Program. S.A.G. was funded by the Canadian Institute of Health Research and Cancer Research Training Program Postdoctoral Fellowships. A.M.S. is funded through the Strategic Cooperative Education Incentive of the Government of Nova Scotia (Economic and Rural Development and Tourism). E.H. and A.N. received a Beatrice Hunter Summer Studentship and a Norah Stephen Summer Studentship from the Beatrice Hunter Cancer Research Institute. K.M.C. is also funded by the Beatrice Hunter Cancer Research Institute with funds provided by the Canadian Imperial Bank of Commerce as part of the Terry Fox Strategic Health Research Training Program in Cancer Research at the Canadian Institute of Health Research. 2013. Breakthrough of the year 2013. Cancer immunotherapy. Science 342: 1432–1433.
. 2010. Ovarian cancer immunotherapy: opportunities, progresses and challenges. J. Hematol. Oncol. 3: 7.
. 2003. Intratumoral T cells, recurrence, and survival in epithelial ovarian cancer. N. Engl. J. Med. 348: 203–213.
. 1996. 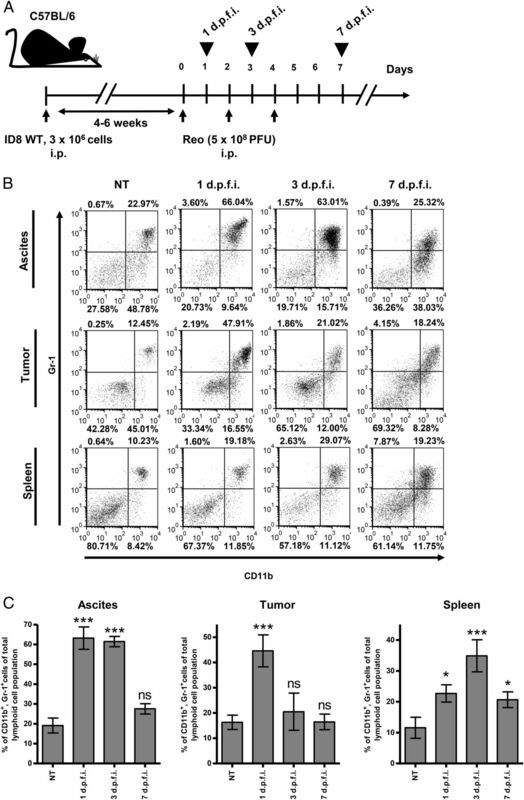 Enhancement of antitumor immunity by CTLA-4 blockade. Science 271: 1734–1736.
. 2011. Cancer immunotherapy comes of age. Nature 480: 480–489. 2012. Immunology beats cancer: a blueprint for successful translation. Nat. Immunol. 13: 1129–1132.
. 1998. Reovirus therapy of tumors with activated Ras pathway. Science 282: 1332–1334.
. 2014. Reovirus in cancer therapy: an evidence-based review. Oncolytic Virotherapy 3: 69–82.
. 2012. Reovirus: a targeted therapeutic—progress and potential. Mol. Cancer Res. 10: 1514–1525.
. 2009. Newcastle disease virus: a promising vector for viral therapy, immune therapy, and gene therapy of cancer. Methods Mol. Biol. 542: 565–605. 2005. VSV-tumor selective replication and protein translation. Oncogene 24: 7710–7719.
. 2014. Maraba virus as a potent oncolytic vaccine vector. Mol. Ther. 22: 420–429.
. 2005. Development of transcriptionally regulated oncolytic adenoviruses. Oncogene 24: 7763–7774.
. 2010. Reovirus virotherapy overrides tumor antigen presentation evasion and promotes protective antitumor immunity. Mol. Cancer Ther. 9: 2924–2933.
. 2011. Oncolytic virus-initiated protective immunity against prostate cancer. Mol. Ther. 19: 797–804.
. 2014. Gemcitabine enhances the efficacy of reovirus-based oncotherapy through anti-tumour immunological mechanisms. Br. J. Cancer 110: 83–93.
. 2013. Multifaceted therapeutic targeting of ovarian peritoneal carcinomatosis through virus-induced immunomodulation. Mol. Ther. 21: 338–347.
. 2009. Immune-mediated antitumor activity of reovirus is required for therapy and is independent of direct viral oncolysis and replication. Clin. Cancer Res. 15: 4374–4381.
. 2008. Reovirus activates human dendritic cells to promote innate antitumor immunity. J. Immunol. 180: 6018–6026.
. 2008. Tumor infection by oncolytic reovirus primes adaptive antitumor immunity. Clin. Cancer Res. 14: 7358–7366.
. 2012. Instruction of myeloid cells by the tumor microenvironment: open questions on the dynamics and plasticity of different tumor-associated myeloid cell populations. OncoImmunology 1: 1135–1145.
. 2013. Reciprocal relationship between myeloid-derived suppressor cells and T cells. J. Immunol. 191: 17–23. 2013. Myeloid derived suppressor cells in physiological and pathological conditions: the good, the bad, and the ugly. Immunol. Res. 57: 172–184. 2010. Myeloid-derived suppressor cells: more mechanisms for inhibiting antitumor immunity. Cancer Immunol. Immunother. 59: 1593–1600.
. 2005. Interleukin-13-regulated M2 macrophages in combination with myeloid suppressor cells block immune surveillance against metastasis. Cancer Res. 65: 11743–11751.
. 2010. Myeloid-derived suppressor cells in parasitic infections. Eur. J. Immunol. 40: 2976–2985.
. 2009. Innate immune CD11b+Gr-1+ cells, suppressor cells, affect the immune response during Theiler’s virus-induced demyelinating disease. J. Immunol. 183: 6971–6980.
. 2012. Myeloid-derived suppressor cells regulate natural killer cell response to adenovirus-mediated gene transfer. J. Virol. 86: 13689–13696.
. 2000. Development of a syngeneic mouse model for events related to ovarian cancer. Carcinogenesis 21: 585–591.
. 2005. Flow cytometric quantification of T cell proliferation and division kinetics in woodchuck model of hepatitis B. Immunol. Invest. 34: 215–236.
. 2009. Gr-1 antibody induces STAT signaling, macrophage marker expression and abrogation of myeloid-derived suppressor cell activity in BM cells. Eur. J. Immunol. 39: 3538–3551.
. 2014. Oncolytic virus-mediated reversal of impaired tumor antigen presentation. Front Oncol 4: 77.
. 2013. Getting to know ovarian cancer ascites: opportunities for targeted therapy-based translational research. Front Oncol 3: 256.
. 2005. Gemcitabine selectively eliminates splenic Gr-1+/CD11b+ myeloid suppressor cells in tumor-bearing animals and enhances antitumor immune activity. Clin. Cancer Res. 11: 6713–6721.
. 2009. Gemcitabine directly inhibits myeloid derived suppressor cells in BALB/c mice bearing 4T1 mammary carcinoma and augments expansion of T cells from tumor-bearing mice. Int. Immunopharmacol. 9: 900–909.
. 2002. 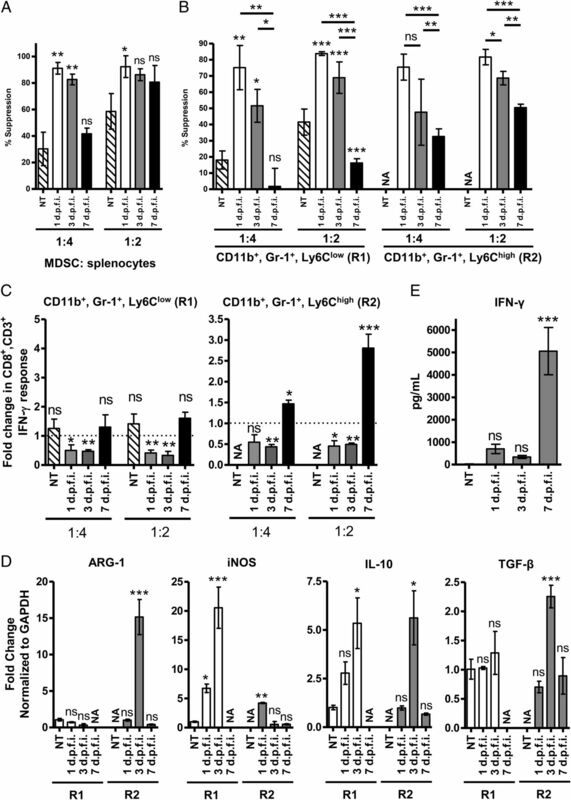 Immunosuppression during acute Trypanosoma cruzi infection: involvement of Ly6G (Gr1(+))CD11b(+ )immature myeloid suppressor cells. Int. Immunol. 14: 1125–1134.
. 1987. Hematopoiesis and suppressor bone marrow cells in mice bearing large metastatic Lewis lung carcinoma tumors. Cancer Res. 47: 100–105.
. 1984. Influence of mammary tumor progression on phenotype and function of spleen and in situ lymphocytes in mice. J. Natl. Cancer Inst. 73: 249–255.
. 2013. 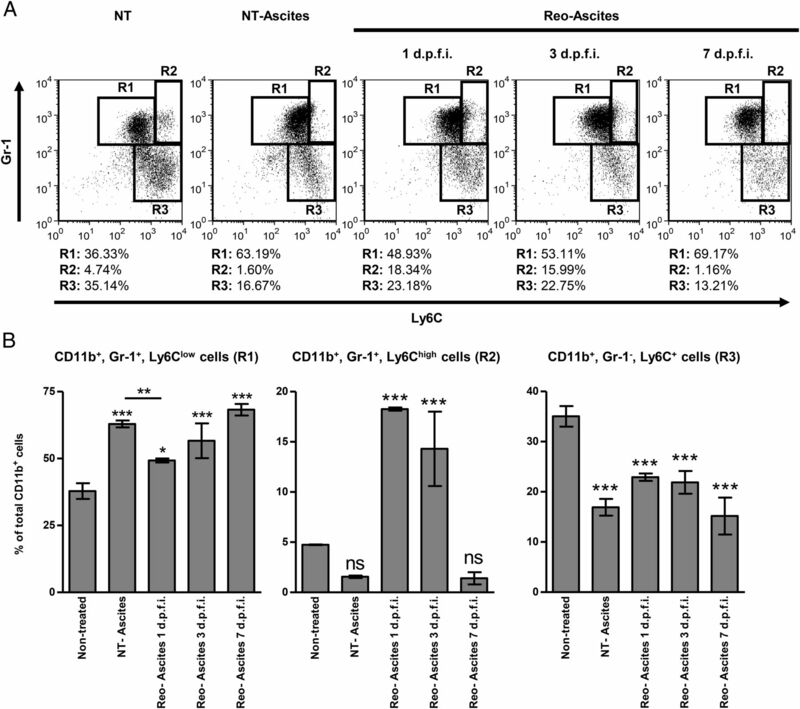 Increased frequency of myeloid-derived suppressor cells during active tuberculosis and after recent Mycobacterium tuberculosis infection suppresses T-cell function. Am. J. Respir. Crit. Care Med. 188: 724–732.
. 2002. Cruzipain, a major Trypanosoma cruzi antigen, conditions the host immune response in favor of parasite. Eur. J. Immunol. 32: 1003–1011.